“Gods don’t grow well in America.” Shadow was learning this first hand. Being Mr. Wednesday’s hired minion wasn’t as cut and dried as he had thought, but where else would he go? He was just released from prison because his wife had died in a car accident with her lover. His new life was full of mythical Gods and magic and the story keeps getting stranger and stranger until Neil Gaiman throws in a shocker at the end. This book was recommended by a friend and a big fan of Neil Gaiman’s books. I agreed to listen to it because I really enjoyed Gaiman’s, The Graveyard Book. 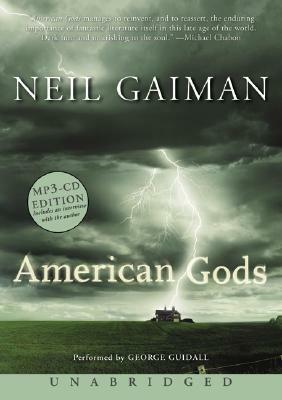 However, the 10th anniversary edition of American Gods was much darker and definitely for adults only. I can honestly say that if I had not listened to the audiobook, I wouldn’t have lasted for the 50-page minimum I give to books when I decide to stop reading them. I really liked the voices of the characters and, to me, it moved the story along even in the really odd dream sequences. Neil Gaiman definitely has a unique imagination which can grab your attention when you least expect it. Thank you to my friend Chris who suggested the book and thank you to Mr. Gaiman for giving me something out of the ordinary to add to my book palate.